Do we say "duh" or "about time" or "that's cool and different"? You know you got some white male privilege in you when you watch a scene and realize that it's probably the only time you've seen three African American actresses in the same scene on television. The trope of The Detective, the Lieutenant, and the pain in the tuchus Internal Affairs Officer, is a dynamic we've seen before. But we just never get to see ALL THREE OF THOSE ROLES PLAYED BY BLACK WOMEN. Yeah, yeah, I know, we can find some earlier exceptions. But they're mightily rare on TV. Sure, we have seen that dynamic before. The Detective, the Lieutenant, and the IA officer. But I can't think of a show where all three of those characters would be black... women. I mean. And they're not 18-year-old models. The majority of the black women are just that, ponderable women. One thing that's really great about it is that anyone could be anything in that scenario. Like we can have a black woman play any sort of character we want because we're free of worrying about "What does that say that we put a black woman in that role?" You mean the role of a pain in the tuchus IA officer? Dramatically it's so dang freeing. 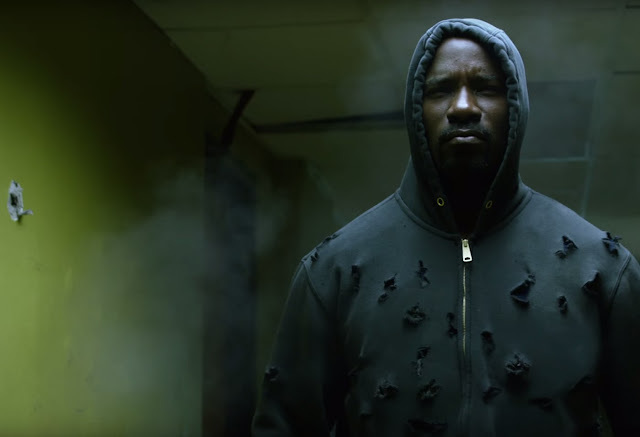 Are there dramatic problems with Luke Cage? Oh yes. Yes there are. Mostly in that our protagonist is so hesitant that everyone else is vastly more interesting. I mean, it's like putting Hamlet and Macbeth in the same play. Hamlet is moping around and Macbeth has unseemed some dudes from nave to chops before the first scene. But the soundtrack is absolutely fantastic.